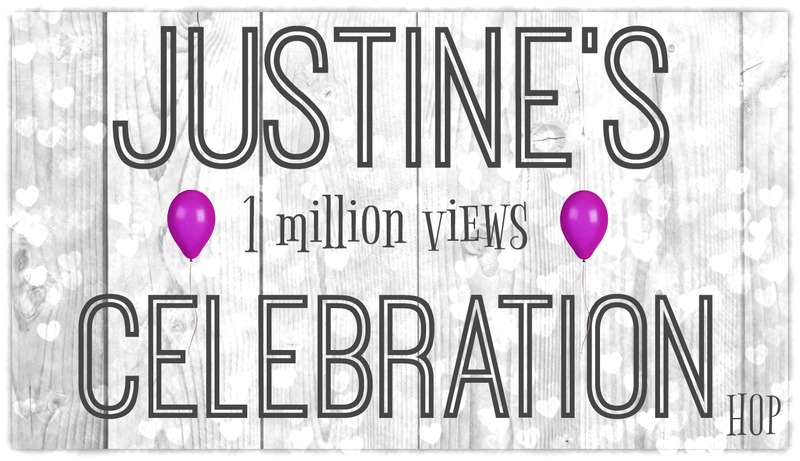 Justine's Cardmaking: Celebrating 1 Million YouTube Views Video Hop! Celebrating 1 Million YouTube Views Video Hop! Welcome to a super exciting event happening both here and on my YouTube channel! I have finally hit 1 Million Views! In order to celebrate and say thank you for all your amazing support, I have put together a video hop to kick off the event! You can win some pretty fabulous prizes and you have all month long to enter this giveaway! That's not even the best part! I will be having a giveaway each weekday, all month long in April! I will link to each day in this post so it is easy to access all the giveaways. 1. Watch all 13 videos (remember you have all month). Start here. 2. Collect the secret word from each video. 3. In the end, the 13 words will form a sentence. Enter the sentence in the form below to be entered to win! Good luck everyone! I will not be using your names or email addresses for any reason except to contact prize winners! Thanks so much for playing along! If you have questions, I have a contact form at the bottom of my blog! Justine... your first link isnt working.. Says it was removed by the user. Lets us know when its fixed.. AND, Congrats! A great accomplishment. Awww Justine, seriously, congratulations...you deserve it! It is so nice to see that you are Canadian as well, as I haven't seen a lot of Canadian crafty YT channels out there. This is what I like to see, cards made by people from all around the world...it will remind us all that although there are many terrifying issues worldwide, we were all created equally. Beautiful card. I am definitely going to try this technique. Congratulations on your 1 million views! Congratulations!!! So excited to hop along and celebrate with you!!! Congratulations on your 1 million views!!! Yay!!! Talk about a beyond impressive milestone...then again, your videos are sooooo amazing that reaching a million views is just, well, logical! Thank you for the giveaways but especially, for sharing your gift of creativity with us! Awesome videos, Congrats and here's to more subscribers! Congrats Justine!! That is an amazing accomplishment!! congrats to you - i enjoy watching your videos! So much fun and I could not stop once I got started! All amazing videos and so many tips and so very much inspiration here. TFS and the chance to win! 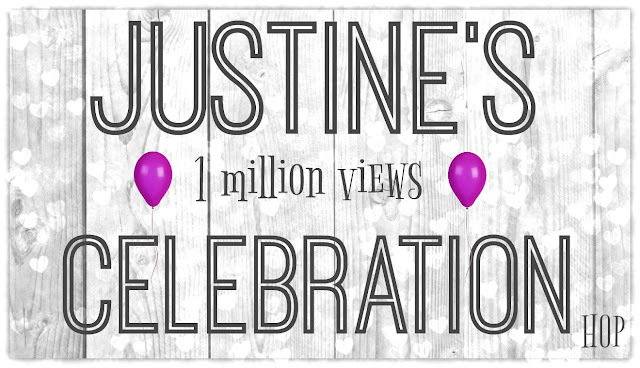 A HUGE CONGRATULATIONS Justine on such an amazing milestone! Congratulations! That was a fun hop! This was a fun blog hop and I enjoyed watching some amazing and inspiring cards being made. Congratulations Justine!! Again, thanks for the fun hop. I kind of watched out of order since some were in my feed this morning. Hope I got the phrase right. Congrats on your achievement. Congrats Justine! Love watching your videos. You are truly an inspiration. Way to go, glad I got a chance to meet you! Woo Hoo to You, Congratulations! Thank you for sharing your talent and thank you for a chance to win some amazing prizes. Congratulations Justine. I always thought you were a little hidden gem waiting to be found. Hopefully the world is catching on now. I especially love your little teaching series that you do from time to time. Congrats on an awesome milestone. WOW!! Great blog hop, loved seeing all of the videos. Thanks for sharing your talents and being such an inspiration. I have really enjoyed this blog hop it has introduced me to several card makers I've never seen before, thanks. Congratulations on your 1 000 000 views, I've enjoyed all of mine. This is awesome, I watched all the videos, subscribed to some new channels and found some new things I need! Congratulations on 1 million! Congratulations Justine! What an awesome accomplishment. You must be over the moon. Congratulations on your crafty accomplishment. Loved all the videos. Congrats!!!! What a fun blog hop! Thanks so much! Great blog and card but how do we get to Tracy Freemans blog... did I miss the link? This was one great blog hop. Not only was it very fun and inspiring, but we also got to meet some new card makers on youtube that we might not of seen or heard of. Thank you for a fun filled afternoon Justine. That has to be the most fun one can have watching YouTube videos! No wonder you have over 1 million views. Congrats! Congratulations!! Thanks for introducing me to a few new YouTube cardmakers. Great idea for a hop! Congratulations on your 1 million views! This was a fun way to spend my evening tonight, and I subscribed to many new channels! Thanks for the chance to win and congrats again! Fun blog. Some new names for me, too. Congratulations! Congratulations to you. I wish you many more. CONGRATULATIONS on your million views! What a fun hop. I got some great ideas. Thank you. Congratulations Justine, so fun hopping along!! You are well respected and loved by many. Your kindness and card making brighten so many people's day!! Keep up the great work!! Congrats on your million milestone!!!! What an amazing accomplishment!!! Great work! Congratulations Justine! Thanks for always sharing such awesome tricks and cards with us! What a great hop and a great way to celebrate!! Congrats on your million views and here's to another million! Felicitations on this milestone! I have been watching your video tutorials (1 stamp set three ways; Christmas card club) for a while now. Love your style. Keep on posting that inspiration! Congratulations Justine!! I subscribe to some of the crafters in the hop and so have some of the words out of order LOL!! I'm looking forward to the hop in order -- such fun!! Justine, I just finished and what a great video hop!~ Great new to me channels, new to me techniques and even one new to me product!! I'm already a winner and congratulations to you again! Congratulations Justine! Great hop, Thanks! Congratulations!!!! Way to go!!! Great hop! Thanks for the chance to win!! Congratulations on 1 MILLION VIEWS!!!! Congrats! What an awesome accomplish! Congrats Justine! I love your videos and you have a lot of talent on your hop! Let's celebrate! What fabulous videos thank you for the opportunity to win and access to all this great inspiration. Fun hop and great cards. Thanks for introducing me to some new folks. Congrats!! Congratulations. Videos and techniques see awesome. Yay! Congrats to you! I LOVE your channel! I'm curious-- what do you do with all the cards you make? Give them to friends/family, donate them, etc? I give them to friends and family and I also send a lot of cards as well. Thank you so much for sharing these amazingly talented people with us on your 1 million views blog hop. Lots of great cards and techniques. I look forward to seeing your videos and theirs in the near further. Again, Congratulations!!!! Congratulations!! This Hop was so much fun! Thanks so much! What a milestone! Congratulations, Justine. Congrats, What an awesome milestone! Love your videos! Your Blog hop was so much fun! congratulations!! Congratulations on your fabulous and amazing achievement ! The blog hop was great fun, I enjoyed all the videos. I wish you continued success. Thank you again for all your wonderful videos. Congratulations Justine, such an accomplishment... and what a FUN way to Celebrate! I Loved all of the creativity and inspiration the gals shared in your honor! Beautiful card! Congratulations on a huge milestone! Congrats to you. Enjoy your videos along with rhetoric other 12. I need all the help and inspiration I can get. Congratulations and I watched all the videos...great inspiration! Congratulations on your Million milestone! I had such a great time on your hop and subscribed to all that I don't already subscribe to. I have been watching your videos for almost 2 years now and love them! Thank you so much. Congratulations on 1 million YouTube views! Quite an accomplishment! I love YouTube hops and this one was fun. I learned some new tips and techniques along the way and got all 13 secret words! I also added a few new youtubers to my subscription list because I like what they showed me! Thanks for the hop, the month of fun and the introductions to new Crafter's! Have a great month of celebration! Congratulations. What an amazing blog hop. Congratulations! So exciting and I love your videos and all the great things I've learned. Thanks for taking the time to share your techniques! Congratulations on this big milestone!!! Such a fun hop, I learned a lot along the way and found some new things to add to the wish list! Congratulations Justine! I'm not amazed that you've hit the million mark because I've loved your videos for a long time. I started through the hop, loving it all. But then after collecting 11 words hit one link that wouldn't work, and got totally lost. Wish I could have finished, but thanks for introducing me to 10 other great artists. Huge congrats and thanks for sharing your joy in this fun way! WOW Congratulations!!! One million views is just amazing!!! I found you through Catherine Pooler and am now subscribed to your channel and your blog. Congratulations on your milestone! Enjoy! Congrats!! Thank you for putting this together and all those that contibuted. Been sneaking peaks when I can. Unfortunatly my busy season at work. When I need a break I been sneeking one in. Keep them coming. Enjoying this. Congratulations! What a tremendous accomplishment and a great lineup to celebrate! I loved the hop and getting to know your work and that of the crafty talented folks in the hop. Thanks for putting this together and again, congrats! Congratulations and loved all the videos. Great inspiration! Congratulations! I really enjoyed the videos and learned some new things! Congratulations on your million views! So much fun and I learned a lot as well as learned about lots of new to me products. Congratulations! Thanks for all you do! Congratulations on this achievement and here's to the next million. Congrats!! Such a fun video blog hop!!! Congrats on reaching your 1 million milestone! Best wishes for more to come! Congratulations, Justine! Fabulous and amazing accomplishment. Loved everyone's video - such fun! And gorgeous inspiration. I really enjoyed this blog hop. It was my first time doing something like this. All the cards were beautiful. I learned a lot of new techniques. Thank you for sharing! Yaay! On a more patient day, I managed to hit all 13, and learned lots. Thanks again. Congratulations and this was a lot of fun! WOW that was one great blog hop, thoroughly enjoyed it, I have subscribed to lots of new you tube channels, and learnt A LOT. Thankyou for the chance of winning a prize and thank you to all the lovely card makers who joined the blog hop too. congratulations to you again also for hitting ONE MILLION VIEWS. I bet you're so happy. good luck for the future. The hop was a lot of fun. Once I got started I could not stop until I had visited and watched all 13 videos. Saw lots of great new ideas. Congrats on 1million views. That is awesome!!! Congrats Justine. Your videos are Fabulous. Enjoy watching them. This was a fun and creative hop. Thank you! Congratulations Justine! I knew you would soon hit this magic number as I have been watching for awhile and think you are amazing! I enjoyed watching all the videos! Congratulations Justine! Wow what an amazing achievement! I've really enjoyed this blog hop and I loved your podcast with Suzy. Congratulations Justine! Wow what an amazing achievement! I've really enjoyed this hop and I loved your podcast with Suzy. What a achievement! Congrats! Your videos are always informative, inspiring and easy and fun to watch! Thanks for sharing your incredible and inspiring creativity with us! Thanks for the inspiration and introducing me to new crafty friends. And thanks for the great prize. Congrats! Thanks for all great prize. Love your videos! Congrats on a million views! I actually watched all the videos the first day and didn't enter until the last (no idea why I did that). Anyway, loved all the videos and it was a fun hop getting all the words to form a sentence. I also found many more channels to subscribe to this way!